I have become a member of "The Ardbeg Committee"… again! So how does that happen? 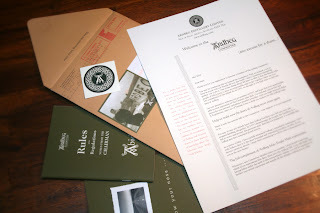 In the recent upcoming promotions for Ardbeg Day I was wondering why I was missing all the emails and it drew my attention to the fact I had not received anything in a long, long time. This is not right but it is what happens when a email account goes into disuse. Not remembering which one I used (I have many for work related testing), and certainly not knowing my password it was easier to just sign up again. Shame on me to begin with but I am glad I did again because I certainly don't want to miss out on another Ardbeg Day never, ever, EVER AGAIN! 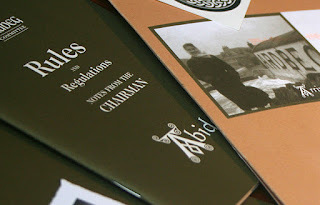 Letter of introduction outlining reasoning for the formation of the Ardbeg Committee as well my official membership number 607311. A small book of Rules & Regulations to be carried bodily at all times or at least when drinking Ardbeg with chums. A brochure outlining Ardbeg's chequered history (but wait I already have this info from my Ardbeg Day winnings of the Ardbeg: A Peaty Provenance), and a small pull off photo I am sure must have been taken on Islay somewhere. Looks like I might just have to replace the photo of the family in my wallet with this. An Ardbeg temporary tattoo. Bit odd really, but I think i will keep this for the next Ardbeg Day unless I get a hankering to slap it on one of my kids. Activities deemed to contravene the spirit of the Committee. Considering the amount of Ardbeg cocktails were being served at Ardbeg Day I think they need to expel themselves. OK so being a member of "The Ardbeg Committee" does not get a cool title and certificate of ownership as being a Islay Land Owner like with when you become a Friend Of Laphroaig, but hey all good things come to those that wait. I would give some tasting notes but I am pretty sure card board and paper taste the same here as they do in Islay but maybe a scratch and sniff peat sample would have been good too. So if you love Ardbeg then become a member of "The Ardbeg Committee" by signing up online so you never miss out on super awesome events like Ardbeg Day.